If you stumble upon this picture, you probably searched for an Iceland Wedding photographer. I hope you enjoy this image from a beautiful series that we shot for our bride Danielle and her brand new husband Matthijs. They got married in The Netherlands and decided to have a day after wedding session in the beautiful country of Iceland. We could not be more happy with their choice! It was a great adventure! They had never been to Iceland but Erik and I have been there several times. 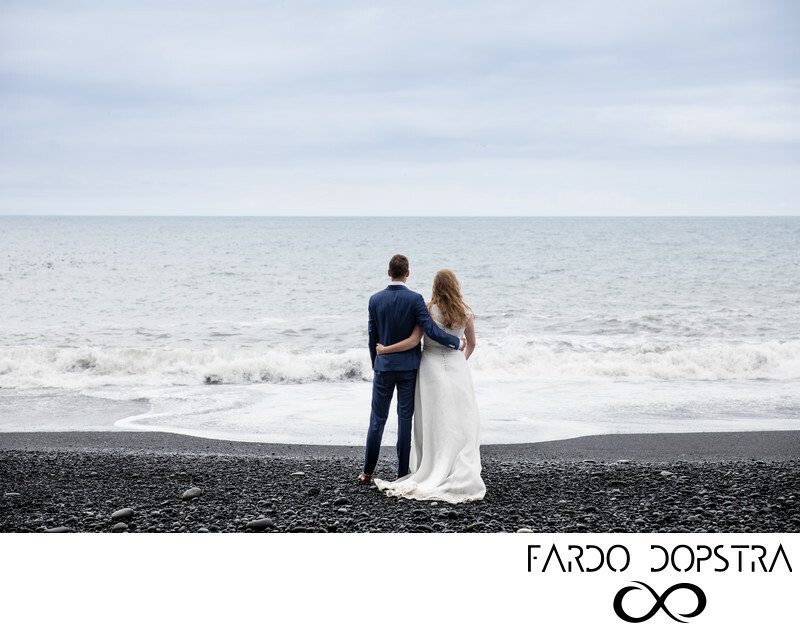 We knew exactly where we could find the best places for wedding photos in Iceland, and when we should be there to avoid the masses. Because, let’s be honest, the land of Fire and Ice is HOT right now! With WOW-Air offering cheap flights to Iceland, and some Game of Thrones filming locations in Iceland, more and more people learn about this fabulous place. Of course, I knew Iceland is of surreal beauty even before the Jon Snow & Ygrytte cave was ever on television and in our lives. I do admit seeing Kirkjufell in the behind the wall footage made my heart jump a bit. But not as much as being in Vík at the Vík black beach and Reynisdrangar with my beautiful bride and groom. The weather was a bit gloomy. In Iceland, the weather changes quickly and to be honest, the landscape is gorgeous in every kind of weather. Danielle and Matthijs were a bit cold in their wedding attire but they had great pictures in mind just like Erik and I did. They were so excited to explore the South coast of Iceland with us. We found some great photo locations, including the abandoned plane crash site, Vík black beach, Jökulsárlón glacier lagoon and some places in between. It was a great start of their honeymoon. They decided to spend that precious time driving the M1 ring road in Iceland to see all that this beautiful country has to offer.